A Proud Day For Saab 99 Fans! 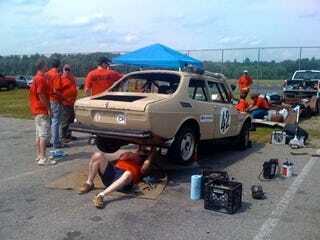 We're sure that all you really scary, foaming-at-mouth passionate Saab zealots aficionados are eager to see how the Adopted By Jets '71 Saab 99 is faring at LeMons New England! So far, the glass appears to be bone dry and covered with leeches half full, as the ABJ team performs what appears to be major surgery on the rear suspension and/or axle and/or fuel tank. But plenty of racing remains, so we expect to see this fine example of Swedish steel dropping components on roaring around the track soon. Thanks to Christine The Arc Angel for the great photos!